Delivering sophisticated Performance and Styling to define premium late-model vehicles. Aston Martin | Audi | Bentley | BMW | Ferrari | Ford | Holden + HSV | Lamborghini | Lexus | McLaren | Mercedes | Porsche | Range Rover | Rolls-Royce | +more. Established in early 2011, the TEKNO Group began as a fresh and exciting face in the Virgin Australia Supercars Championship. Today, with many race wins to its credit (including the 2016 Supercheap Auto Bathurst 1000 and 2016 Bathurst 12 Hour) TEKNO, based at Yatala, QLD, is an Australian family business led by racer Jonathon Webb and backed by the knowledge and experience that comes from 35 years of involvement in racing and motorsport. TEKNO’s Supercar campaign with its demand for highest quality workmanship, led to the introduction of Jonathon Webb’s TEKNO Performance, a dedicated road car engineering division specialising in the performance enhancement of premium late-model vehicles. At the heart of TEKNO is our people. We have formed one of the tightest, most effective and inspirational organisations in the industry. #teamTEKNO is comprised of industry leading engineers and mechanics whose combined skills are driving our group to the top ranks of Australian motorsport and the performance vehicle industry. 2016 Bathurst 1000 Champion, 2016 Bathurst 12hr Champion. 24hr Dubai International Champion. 2016 Bathurst 1000 Champions - TEKNO with Jonathon Webb and Will Davison. Keep an eye out for us: Currently TEKNO Autosports prepare and race a Holden ZB Commodore Supercar. 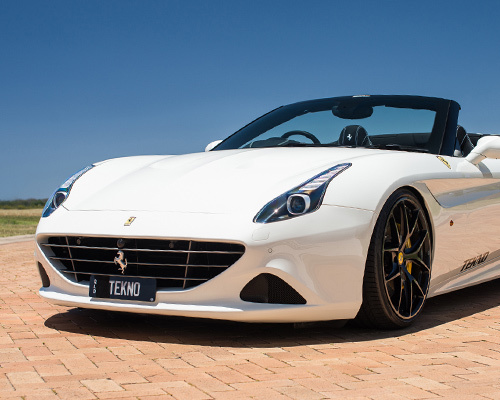 TEKNO Performance vehicles are delivered via our Queensland Headquarters, or NSW authorised reseller and selected South East Queensland car dealerships. At TEKNO we fit the best. Each European Vehicle is unique - so is your Performance and Aesthetic take on the customisation of your special vehicle. TEKNO pride ourselves in sourcing, testing and delivering the latest in premium product from around the globe. Simply provide us your Vehicle make, model and aim and we will deliver product solutions tailored to your vehicle. Akrapovič is synonymous with the highest level of design, performance enhancement and the creation of an unmistakable deeply resonant exhaust sound. HRE designs, engineers and manufactures 3-piece, 1-piece and ‘built-to-order’ wheel sets, offering customisation of offsets, widths and finishes. Delivering unique style and performance solutions, HRE is the premium wheel selection for Racing, Performance & Luxury cars. KW Automotive delivers premium car tuning and automobile refinement, offering comprehensive suspension programs from springs over sports suspensions to coilover suspensions. Quality awareness, determination, creativity and vision. Novitec specialises in precise engine modifications and quality products adopting optimal technical efficiency and avant-garde styling. AWE Tuning innovates, designs and produces performance products fromhandcrafted exhausts, throughto track tested carbon fibre intakes and performance intercoolers. Developed and tested in both road and racing environments, Velocity AP provides seamlessly integrated upgrades to maximise the performance of your exotic vehicle. Evolving continuously to bring an influential combination of quality, design and fitment. ANRKY Products stand for superior craftsmanship, quality, design, engineering, and manufacturing. - HRE P101 Wheels : from $14,900. - Novitec Sport Spring Set : from $2,700 fitted. - Novitec Switchtronic Exhaust Controller : from $1,200 fitted. - Akrapovic Exhaust with Carbon Diffuser and Sound Kit : from $18,200 fitted. - HRE P101 20”+21” Wheels : from $14,800 fitted. - KW Coilovers : from $5,500 fitted. - Velocity AP Exhaust Package : from $14,500 fitted. - 20” Custom TEKNO Wheels : from $7,500. - Michelin Pilot Sport 4S Tyres : from $2,900 fitted. - Velocity AP Progressive Spring Rate Lowering Springs : from $2,300 fitted. - Akrapovic Titanium Exhaust System (feat. 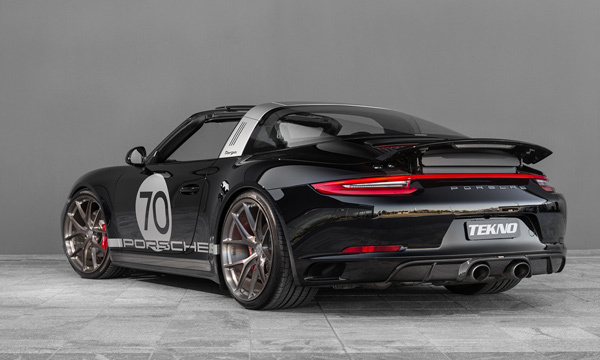 Carbon tailpipes) : from $15,200 fitted. - HRE FF01 20” Wheels : from $4,800 fitted. - KW Height Adjustable Spring : from $1,990 fitted. - Custom TEKNO tune : P.O.A. - Custom TEKNO Carbon Fiber Accents - Front Lip, Door Sills etc. : P.O.A. - Painted Flares, Nudge Bar + ‘Black Out’ Aesthetics. - Premium Suspension Package including shock absorbers + springs. - 18” Wheel and Tyre Package. - 20” custom wheels : from $2,300. - KW height adjustable spring kit : from $1,990. We proudly host events both at TEKNO HQ and offsite. Information about upcoming events will be listed here and via the TEKNO Performance Social Channels - stay tuned and we hope you can join us at our next get together! TEKNO is a lifestyle – so much more than our competitors. Join us for TEKNO hosted drive days, open days, Supercar events. Become part of #teamTEKNO. Motorsport philosophy is our backbone. Performance, quality and individuality are paramount. 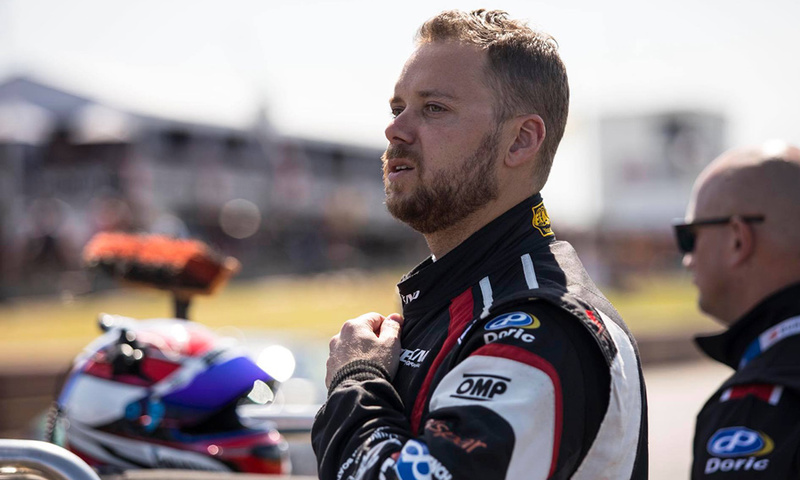 Mechanical performance and empathy is the basis of TEKNO’s Managing Director - Jonathon Webb’s motorsport career and success. He personally oversees the day to day operations of the TEKNO brand. R&D: Extensive Research and Development is performed in-house. We source technology and push the boundaries (using our own assets), thereby allowing TEKNO to deliver the ideal mix of Performance + Safety + Reliability + Style – specifically tailored to meet Australian demands. Your pride and joy will be treated with utmost respect and never as a test pilot. New, clean and state of the art. TEKNO use only the best tools and equipment. Rest assured we will treat your pride and joy as one of our own. Your vehicle will be treated by a hand selected highly skilled team of mechanics, engineers and tuning professionals. Let us guide you. We’ve built them all. Track, rally, drag, street and show cars. We pride ourselves in being set up to expertly engineer the perfect combination of performance components to allow you to maximise your vehicles performance. Contact us via email, or phone 07 3807 6604 / 0427 706 403 to prepare your custom build quote. TEKNO offer a range of packages spanning the different LS engines within the Holden and HSV range, broken in to Stages to allow you to tailor the ideal performance outcome for your needs. We can create anything from "a bit more noise and power", to a 600kw+ Supercar. Let us share our extensive experience in road and race vehicle preparation to help you create your ultimate vehicle. Mercedes Benz initially released an X-Class concept packed with attitude. However, when the Australian delivered X-Class arrived some believe it fell short of delivering that desired aggressive look. TEKNO Performance have created an X-Class build that definitely adds sophisticated ‘toughness’ + performance to the newly created luxury dual-cab Ute market. Featuring flared guards, custom wheels fitted with aggressive tyres and an improved lifted stance. Beyond looks, TEKNO fitted new shock absorbers, springs, nudge bar + blacked out standard chrome accents. For added convenience TEKNO included a fully automatically opening (via remote) tonneau cover. TEKNO Performance X Miami/Coyote V8. Let us walk you through some of the ways we can enhance your pride and joy. Premium Leather and Alacantra trimming to seats, steering wheels, headrests etc. : please contact for a custom quote. Custom Vinyl or Paint work to create a permanent or semi-permanent style that sets your vehicle apart from the crowd. : $P.O.A. TEKNO floor mats also available. Available from TEKNO PERFORMANCE : please contact us for a custom build quote. TEKNO Performance have undertaken the 4x4 Ute specific research and development required to significantly enhance the HOLDEN Colorado. Suspension, wheel + tyre packages, aesthetic and comfort enhancements which give you practicality and an all-important custom experience to set your vehicle apart from the crowd. Let TEKNO help you find that ideal mix and allow you to get the most out of your ride. We like our Colorados two ways, #TEKNOhigh and #TEKNOlow. Individual Aesthetic Customisations for Exterior and Interior (colours, designs and textures) – P.O.A. TEKNO door decals, TEKNO boot badges, custom Leather or Alcantara upholstery, TEKNO floor mats, TEKNO front headrest kit – the fun is in the details! Contact our Team sales@teknoperformance.com.au, 07 3807 6604, 0427 706 403 for details. Service and Maintenance is important; treating your TEKNO Enhanced Vehicle to Service by TEKNO will enhance performance, reliability and resale value. TEKNO proudly offer specialist technicians who understand the demands of your Vehicle Make and Model and any Performance enhancements applied. Please contact me to discuss Service and Maintenance of my Vehicle. Please contact me regarding Availability. Anything we need to know? Vehicle Make + Model, Year, Km's, Performance Enhancements, notes etc. TEKNO have sourced the best of the best when it comes to Vehicle Detailing. Performed inhouse at TEKNO - with premium products and tools, we give you better than that brand new car feel. TEKNO deliver Show Car results - mirror shine and paint smooth as glass. Pricing upon application - contact us via email, or phone 07 3807 6604 / 0427 706 403. TEKNO Performance offer flexible finance options* to approved customers for performance packages and custom modifications with our finance partner - Morris Finance. Most applications take as little as 24-48hrs for approval, via a streamlined and easy process! Allow TEKNO’s sales team to tailor payment options to suit you. *Conditions apply, consult TEKNO for further details. Finance currently available Via TEKNO Performance HQ, Yatala QLD. Planned modifications to your Vehicle. Thank you! Your Finance Enquiry has been sent. We will be in touch! Q. Who am I borrowing the money from? Q. How does Morris Finance differ from a bank? A. Morris Finance can offer clients faster and more carefully tailored flexible solutions than most banks. A. Approval times can vary as each application is different; we strive to have an answer within 12 – 24 hours in most instances. A. The minimum amount Financed starts at $5,000.00 and there is no maximum. However each application is assessed on its own merits and the capacity of the borrower. Q. Can I payout my facility early? A. Yes, you can contact one of Morris Finance Ltd.’s customer service specialists and they will be happy to assist. Q. Can I make additional payments on my Account? A. Yes, Additional payments can be made at any time. Q. What is your interest rate? A. Interest rates vary depending on the type of financial product, the term, amount of the loan and the credit risk. Q. Why should I do business with Morris Finance? A. For flexibility and understanding. As your needs fluctuate during the term of your loan, you can create convenient structures from an array of customized lending products. Q. What will the loan with Morris Finance allow me to do in future? Q. What are the Fees and charges? A. There are no initial or ongoing account fees. Q. Can I claim the amount financed or repayments? A. Yes – Morris Finance Ltd offer the full range of financing options for business, Leasing, Chattel Mortgages, and Hire Purchase. Our experienced staff can advise the benefits of these products to assist you come tax time. 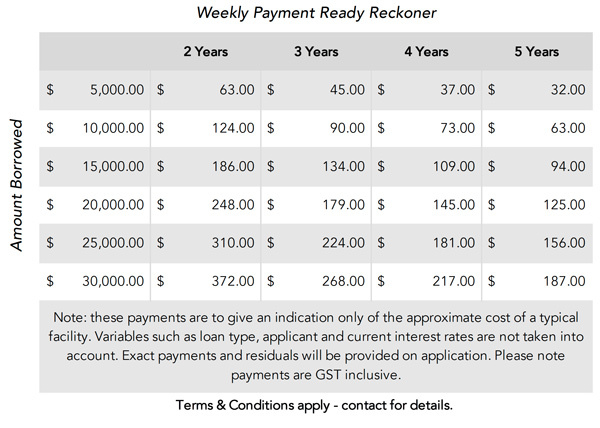 *Weekly payments are based on approximate investments financed over a certain amount of years. These payments are an indication only and variables such as loan type, applicant profile and current interest rates are not taken into account. Exact payments will be provided on application. Here’s to you - personalised plates are just another way of telling part of your story. Let TEKNO + PPQ celebrate what’s important to you, have your vehicle enhanced and complemented - no detail missed. We value your time- let us know how we can help you! Warranty : Warranty is provided in line with your rights under Australian Consumer Law; 12 months parts and labour from date of purchase for repair/replacement performed by TEKNO at their facilities. Work performed on TEKNO supplied and fitted parts by parties other than TEKNO will void your warranty rights. Further warranty entitlements apply to certain packages fitted to applicable vehicles. You will be advised at the time of purchase if your vehicle qualifies for further warranty entitlements, the warranty will be detailed on your sales invoice. Cancellation : TEKNO may terminate a Contract if a product is not available for any reason. We will notify you if this is the case and return any payment that you have made, using the same method originally used by you to pay for the product. Should you wish to cancel your order, please contact our Team. Cancellation fees may apply. Product Faults : We aim to provide you with Products of the highest standard and quality. If you have received a Product with a defect, please contact us as soon as possible so we can guide you through remedy processes and help resolve issues as swiftly as possible. If the Product is confirmed to have a defect, we will replace the Product or subject to TEKNO discretion, refund the Price of the Product to your original payment method. It does not constitute a defect, if in TEKNO’s reasonable opinion, the Product has, following the sale to you, become of unacceptable quality due to fair wear and tear, misuse, failure to use in accordance with manufacturers’ instructions, using it in an abnormal way or failure to take reasonable care. Change of Mind Returns : TEKNO do not offer Change of Mind Returns. Nothing in this detail is intended to exclude any of your statutory rights as a consumer under Australian Consumer Law. The Site and the content on the Site are subject to copyright, trademarks and other intellectual property rights. These rights are owned by or licensed to TEKNO. You must not reproduce, transmit, communicate, adapt, distribute, sell, modify or publish or otherwise use any of the material on the Site, including audio and video excerpts, except as permitted by statute or with our prior written consent. This website is for your general information and is subject to change without notice. Neither TEKNO nor any third parties provide any warranty or guarantee as to the accuracy, timeliness, performance, completeness or suitability of the information and materials found or offered on this website for any particular purpose. Information about goods on the Site is based on material provided by third party merchants, suppliers and product manufacturers. Except as required by law (including the Australian Consumer Law) we are not responsible for inaccuracies or errors caused by incorrect information supplied to us or by these third parties. Due to photographic and screen limitations associated with the representation of products, some actual products may differ to a small extent in visual appearance (for example in colour) from the way they appear on the Site. In addition, where it is suitable to do so, some depictions of products are created or chosen by us for promotional purposes, and may not be an exact representation of the products received. All Prices listed are in Australian Dollar (AUD) and include GST.